The United States economy has gone through some lean periods but, given time, it always seems to bounce back. However rough today’s economic seas may feel, we would do well to remember that they have been worse. Today marks the 23rd anniversary of Black Monday, the steepest single day fall in market history. To commemorate the resilience of the U.S. stock market, we present you with a recession-proof sale. Allow us introduce you to “scripophily:” the collecting of old stock certificates that have no monetary value. If you’re wondering why anyone would ever do such a thing, take a look at the beautiful hand-engraved image below. Before television commercials or even widespread print media, the stock certificate was a company’s favored means of projecting a brand image. Tamarkin and Krantz have compiled over 150 full color stock certificates that will inspire artists and investors alike. Written by Pat Croce, Illustrated by Julia Wolf. What started as a surprised yawp in response to a sports injury has since exploded into a global phenomenon with participants on every continent and the seven seas in between. Few have captured, or been possessed by, our cultural fascination with scurvy sea dogs as Pat Croce, who operates the Pirate Soul Museum in Key West, Florida. 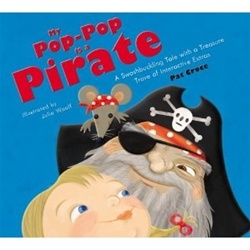 My Pop-Pop is a Pirate will enchant junior picaroons with its fanciful storyline, lift-up flaps, pull tabs, 3-D touch-and-feel elements, and pop-up surprise ending.